Over the years there has been a slew of products marketed to shooters that claim they will “revolutionize” how we shoot. Most fall short of that mark. I have been shooting for over thirty years and have not found any gadgets which will help you shoot better—at least, I haven’t found anything that replaces proper practice and instruction. 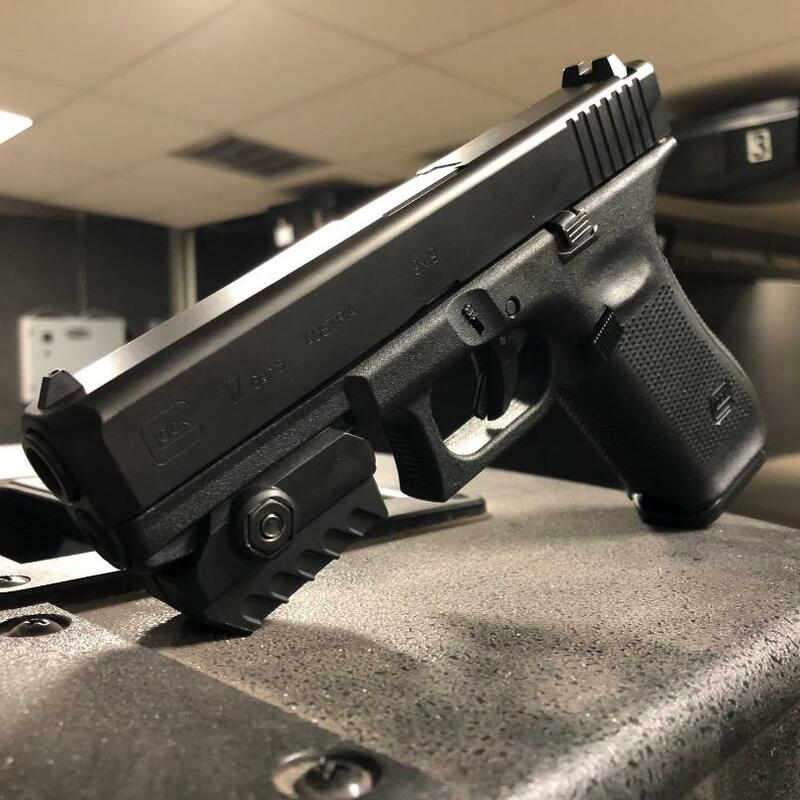 Recently, I got the chance to try out the MantisX, a small device you snug onto your handgun (or rifle) rail, which tells you specifically what you’re doing right and wrong. The overall goal is to improve your shooting. I’m happy to report that the MantisX did exactly that! I wondered as I opened the small Pelican Box containing the MantisX, if it would help turn me into some kind of Robocop with hand-eye targeting telemetry, equipping me for amazing shots with my Auto 9. I soon found the secret to the shooting aid lies in the age-old premise of “practice makes perfect”. The unit is a battery powered (USB rechargeable) device which measures minute amounts of muzzle wiggle after being mounted to most guns with a rail under the muzzle. Installation is easy, you simply slide it on then tighten it down with a common screwdriver. It also affixes to rifles though if you mount to a side rail on a rifle, you need to reflect this in the settings. Next, install the MantisX app on your phone. Once the app is up and running, it will direct you how to link the device. This Bluetooth connection was easily established and then I picked through a few options—which way the unit was facing, whether I was shooting live or dry fire, and whether I was left or right handed. I was up and running in no time at all. The whole setup was very easy and intuitive. The app features a number of options like MantisX Benchmark, Reload, In Battery, and a few others. I wanted to jump right in to see what this unit would tell me so I selected Open Training. There, I loaded my Gen 5 G17 and stepped up to the target. With a smooth presentation and focus, I fired my first shot. My fellow firearms instructor was standing next to me, holding my phone with the app running. The screen showed a bullseye with crosshairs. The screen also displayed a series of colored lines. There was a blue line hovering around the center of the target. A yellow line traced a short path, then a red line which originated in the same area before shooting off the screen. What did these mysterious lines represent? They are the three stages of your final shot. Much goes into the presentation, aligning, and shooting of a gun, but this colorful map represents that final piece. The blue is the MantisX showing you your pistol’s movement as you line up your sights. The yellow represents the movement of your pistol as you squeeze the trigger. The red is the immediate aftermath of recoil. As a firearms instructor, I could immediately see the value of such a tool! Although there are many steps that lead up to this final piece of actual shooting, this device focuses on that magical moment—the final culmination of all your efforts—where you take your shot. So many things can go wrong in that final space in time. You can use too much trigger finger and have it pull your shots. You can jerk the trigger, which typically pulls your muzzle down, causing your shots to be low. The anticipation of recoil can cause a lot of issues too. Thankfully, the MantisX is programmed to understand these things and graph them out for you. It can also come right out and tell you what it’s interpreting. Open Training for steady plinking which is later averaged. MantisX Benchmark where you shoot 10 shots for performance. A Timed version that sounds a buzzer each time it wants you to shoot. 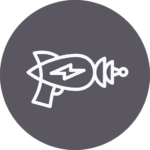 Compressed Surprise Break is a little daunting as you start on target, then squeeze the trigger as quickly as you can when the buzzer goes off. This enlightening drill shows you how bad things tend to flub up when you sacrifice accuracy for speed. It also helps you blend the two. There are several reloading drills, In Battery, Out of Battery, and Tactical. These begin with a buzzer, then end when you complete a reload and shoot. Again, you see how rushing affects your shot when you finish manipulating your weapon and finally squeeze one off. There are also modes where you shoot Primary Hand Only and Support Hand Only. These are always challenging because we so often focus on that proper two-handed shooting style, single hand gets neglected. After a range trip testing the Support Hand mode, my support hand feels as though it’s willed by someone better left to play with crayons. All of these drill modes add value to the MantisX and can improve overall skills in the areas they are designed to offer feedback in. 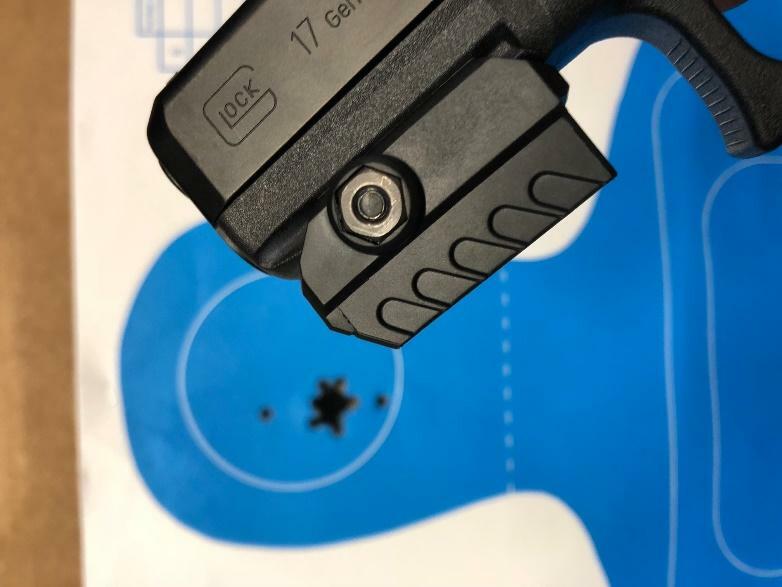 For one Open Training drill, I fired 17 rounds from the Glock 17 at 7 yards. My goal was marksmanship, taking my time, aiming for the same basic spot on the target. With the MantisX’s coaching, I was able to achieve the following group. One jagged hole with a couple of flyers is not bad! I tested the MantisX on a Glock 17, a Kimber Warrior, and an Armalite M-15 (AR-15) and it worked perfectly on each weapon. Did the MantisX make me a better shot? Yes! My average score improved over the sessions I used the tool. I believe the feedback given by the MantisX makes you more mindful of your actions when you are just about to send one downrange. It points out common errors you’re making and this allows you to fine-tune things accordingly. That being said, there are some limitations. A novice shooter cannot purchase this device and hope to become a great shot with it. There are too many things an instructor must teach you before you can get started. 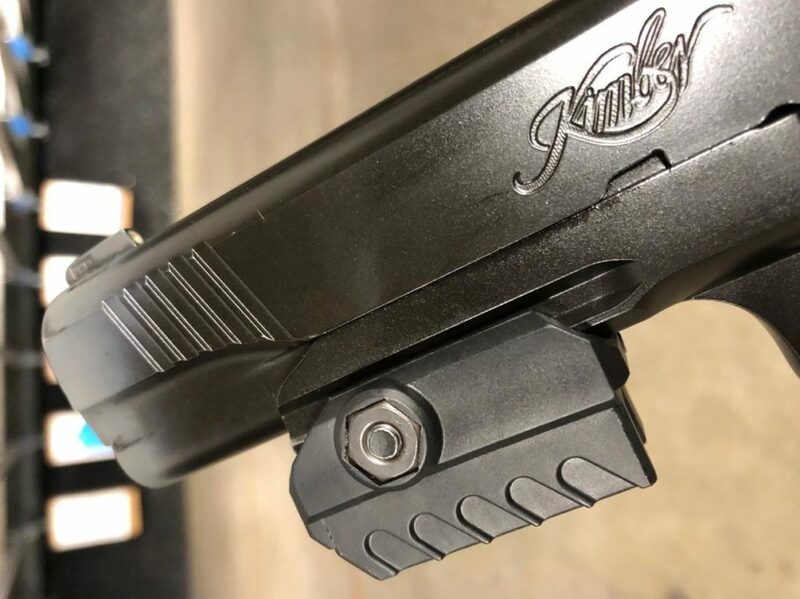 Critical steps like stance, grip, draw, sight alignment, sight picture, trigger press, and breathing are not things an app is going to give you. Once a shooter has a solid understanding of these foundational steps, the feedback from the app will make a lot more sense! The app and device can take a novice shooter to new levels of accuracy. Also, shooting solo is a consideration. If you are in a booth at the range, you can place your phone somewhere you can easily read the feedback. What tends to work best is having another person with you, giving you the feedback directly. This way you can stay in the moment (stance, grip, etc.) and focus on implementing the corrections. The MantisX is a wonderful shooting aid, capable of giving you large improvements in your marksmanship. It was easy to install and easy to use and from my testing seems to be highly durable. While this isn’t a replacement for training or a magical cure for bad shooting – it does help you make the most of the training that you put in, both at home dry firing and at the range during live fire. Think of the MantisX as a mini-shooting coach that you can get feedback from any time, anywhere. Lets hear from you, do you use a MantisX? What about other shooting apps? Let us know in the comments! 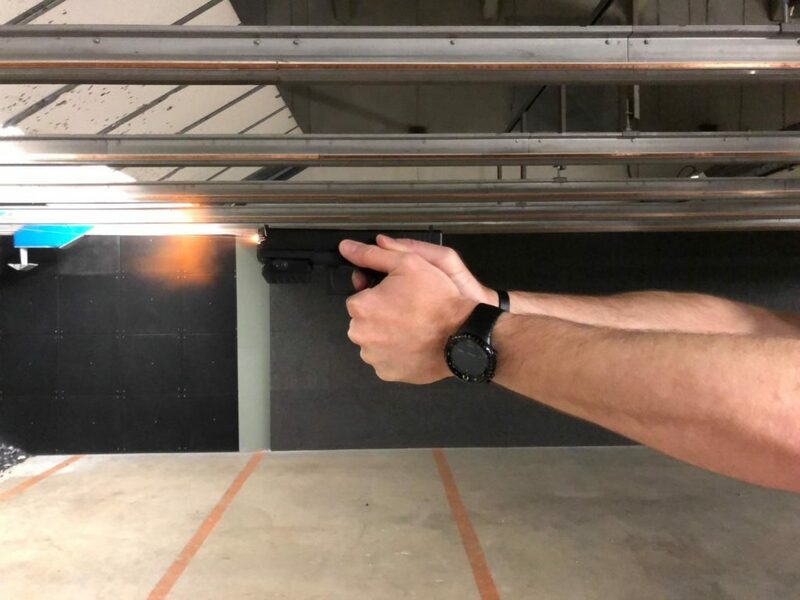 Need more help…check out our Ultimate Guide to Shooting a Pistol Accurately or How to Choose Your First Gun Training Class. Santa brought me one of these for Xmas. More than 6K dry-fires later, I can put 10 in a row in an eye-socket (sub 3/4″ groupings at 7 yards w/ G19). (Stumbled on this as I was looking for an adapter to mount on a magazine, so can draw from holster and continue training with the Mantis…love it). Another great read. And I’m sold. I’m definitely getting one of these! Thanks for the very informative review and for linking it to your dry fire article. I have many Bluetooth devices and none have required Location to be turned on. What’s the catch, why do you need to know where I’m shooting in order to gather hand movements during practice? Please explain. That does seem odd, likely has to do with needing the same permissions as the location setting so that the app can access the gyroscope of the phone. You would have to contact MantisX directly to find out for sure though. Do I understand correctly that you have to use a single hand? That it isn’t designed for two-handed grip? Is there a target you use with the MantisX? I did not see one on any of the videos. No required target – you can use literally anything to aim at! The system is purely from the gun mounted device and your smartphone so there isn’t a need for anything extra. You can even just use a plain wall or any random object around the house. Don’t aim at people or pets though, safety first!